Fernando Alonso: Join McLaren now or gamble on Mercedes? Fernando Alonso is trying to decide between joining McLaren for 2015 or taking a sabbatical in the hope of joining Mercedes the following year. Although it has not been announced, the Spaniard's Ferrari contract has been terminated at his request and the team have signed Sebastian Vettel for 2015. The double champion's only Formula 1 option next year looks to be McLaren. Asked how much danger there was of ending up without a drive, Alonso said: "Probably not a big risk." McLaren are waiting for Alonso's decision before finalising their 2015 line-up, so the futures of current drivers Jenson Button and Kevin Magnussen are under threat. "You shouldn't worry about me," Button said. "I am in a great place in my life right now and whatever happens next year I am happy. "It was tough for a little while but it's not any more. It's tougher for my team-mate. "I have been in the sport for a long time. I have won a world title and 15 races but Kevin is in his first season and there is more pressure on him to get a drive. I just hope they make the right decision." In five seasons at Ferrari, Alonso has always been the dominant driver, scoring more than two-thirds (68%) of the team's points. Button, 34, has scored nearly double Magnussen's points this year but the Dane's qualifying pace has impressed - he leads Button nine-seven in his rookie season - even if his weaker performance in races is a concern for the team. McLaren insist they have no signed contract with Alonso. But it is understood a multi-year deal has been agreed and is waiting to be finalised as the Spaniard weighs up what he considers to be the best option for his future. Although McLaren and new engine partner Honda want evidence that Alonso is committed for the long term, joining McLaren for 2015 would not necessarily mean he would stay for more than a year. Any deal will inevitably have performance clauses which would allow him to leave at the end of next season if those were not satisfied. Typically, these would require the team to be third or fourth in the constructors' championship by the end of the summer. McLaren have had two difficult seasons but have worked hard to persuade Alonso that they are solving their problems and that Honda's engine will be competitive when it makes its debut next season. Insiders say the Japanese turbo hybrid is showing strong performance on the test bed at the Honda factory, and the company has the advantage of knowing the performance of the current Mercedes engine and therefore what it has to aim for with its design. If Alonso does choose to take a year away from F1, it should not be taken as an indication he has secured a promise from Mercedes that they will take him on for 2016. Nico Rosberg's contract runs until the end of 2016, but Lewis Hamilton's expires a year earlier and Alonso is exploring the possibility of Mercedes signing him rather than seeking a new deal with the Briton. But he will have to wait until the end of the season if he wants to pursue that option. Mercedes F1 boss Toto Wolff said: "We have a contract with both of our drivers for 2015 and we want to continue with the current line-up. "If you get somebody else in, that could be detrimental to the team performance, so our main priority is to continue with Nico and Lewis beyond 2015. "We have agreed with Lewis we want to concentrate on the championship and give him the exact same possibility as Nico not to be involved in some commercial, financial legal discussions until Abu Dhabi. "And my commitment to him is we are not going to talk with anybody about any terms of contract until then." Neither Williams nor Lotus, both of whom will use the standard-setting Mercedes V6 turbo hybrid in 2015, are an option for Alonso, who said after the Russian Grand Prix that he did not think he would be using a Mercedes power-unit next year. Mercedes are aware of the possibility of McLaren-Honda offering Hamilton a huge salary to try to tempt him to rejoin the team he left at the end of 2012. If Hamilton did leave, Alonso would be a serious option for the team and a guarantee they would lose nothing in performance, although Williams's rising star Valtteri Bottas would also be of interest to the world champions. Alonso is regarded by many within in F1 as the best driver in the world, but if he does take a sabbatical, it would be a huge career risk. With his bridges burned at Ferrari, and Red Bull not interested, there would be a possibility Alonso would never be able to get back into F1. 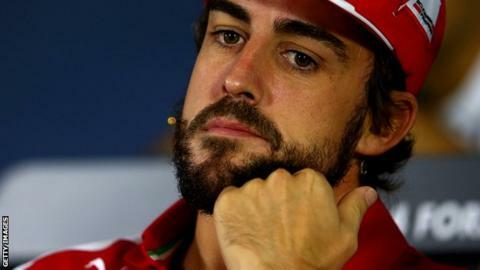 Alonso had been under contract to Ferrari until the end of 2016, but relations between himself and the team reached breaking point last month and he was granted his request to be released from his contract. Red Bull promoted Daniil Kvyat from Toro Rosso to replace Vettel.